He’s been tipped as a man who’d be an excellent as skipper on US spoil in 2016 - after all, he’s got that larger than life, hard-drinking, cigar-chomping, broth of a boy image that many Americans lap up. But is he really a non-runner for the job at Gleneagles just because he said the Centenary Course was one step above a cabbage patch? I think not. There’s too much at stake and if there are any anti-Paul McGinley factions out there, they’ll find a willing poster boy in the 2011 Champion Golfer. “It’s unbelievable they chose to stage the 2014 Ryder Cup on this course. There are unbelievable courses in Scotland, not least of which are the two others at Gleneagles, the King’s and Queen’s. So it’s beyond my comprehension they’ve chosen to have the Ryder Cup on this course. Surely it would be a bit hypocritical to play in a tournament there, let alone pitch for the captaincy on the horrible course design. Not in the slightest. Is he referring to qualifying for the Ryder Cup or the competition itself? Either way, Jim Hacker’s civil servants couldn’t have put it any better: So what if I said the course was crap, this is the biggest and best money making event in the world. It’s all about tradition and, as Woosie reminded us on those never ending TV commercials, the shirts! But why would Clarke want to do the Ryder Cup captaincy now when there are so many other majors to be won? There’s the €2m plus he’d make from endorsements for starters. Also, it seems Darren himself admits that he may finally be sliding inexorably into irrelevance! What about the majors Darren? Oh, okay. So what about the Ryder Cup captaincy in Gleneagles, Darren? After all, the Ryder Cup is so much bigger than any individual’s personal opinion about a golf course. And as the man who has everything, it’s all that’s left for him to do (apart from win another major or two). Right? Darren Clarke says he would "relish" the honour of being handed the European Ryder Cup captaincy. Miguel Angel Jiménez in the interview room ahead of the Ballantine’s Championship at Blackstone Golf Course, Icheon, Korea. (Photo Jenny Matthews/www.golffile.ie)Paul McGinley’s 2014 Ryder Cup captaincy hopes are in danger of going up in smoke. While Darren Clarke has promised not to rival the Dubliner for the job in Scotland, reportedly putting his ambitions on hold for 2016, cigar-chomping Miguel Ángel Jiménez is emerging as his biggest rival for the job. 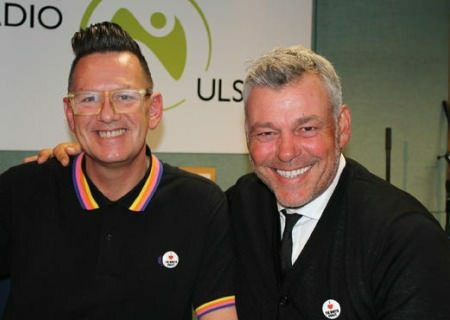 Darren Clarke pictured with radio presenter Alan Simpson earlier this week. Darren Clarke would “dearly love” to be Ryder Cup captain in Gleneagles but he doesn’t rule out the possibility of two Irish captains in a row.